We now know what Alexander Graham Bell, known as the inventor of the telephone, sounded like. Some scientists in the United States recently released a recording Bell had made of his voice in 1885 on a wax-coated cardboard disc. A museum in the United States had this disc, but didn’t have the means to hear what was recorded on it. About 5 years ago, some scientists were able to play back a recording made in 1860. It is the oldest known recorded human voice of a woman singing a 10 second clip of a French folk song, which you can hear here. The folks at the museum got in touch with these scientists and now all of us can hear Bell’s voice. Bell was born in the United Kingdom in 1847. 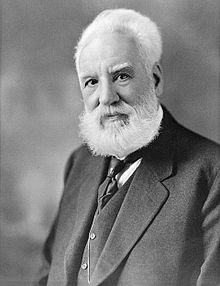 He moved to North America at the age of 23, and invented the telephone in 1876. His first sentence on the telephone was to his assistant in another room, “Mr Watson, come here, I want to see you.” Bell died in 1922.